Use these helpful hints to hold micro guides in place while spacing, aligning, and most importantly, wrapping each guide. Unfortunately, these awesome little guides are just that—little guides. Micro guides are only a fraction of the size of most running guides. 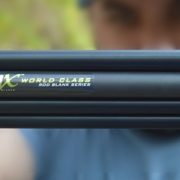 Thus, the “micro” in these guides is obviously there for performance, however, it also makes them a bit more challenging to work with in rod building. Compared to larger running guides, micro guides take more caution and care to successfully wrap onto rod blanks. 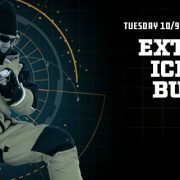 In other words, if you use the proper tools and appropriate techniques, you can wrap micro guides as easily as a size 20 stripper guide. For starters, it’s hard to suggest using micro guides without also suggesting micro guide bands to go with them. 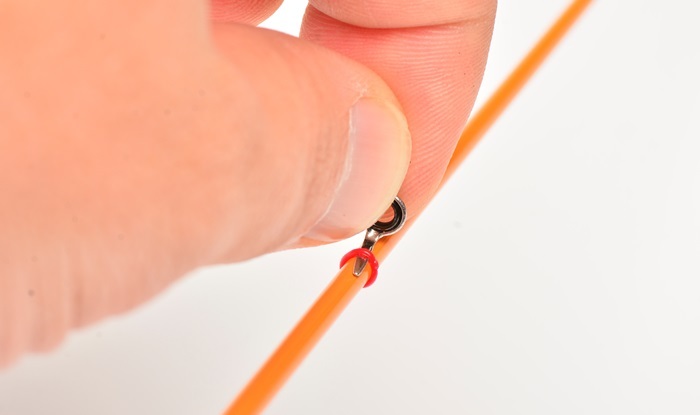 Micro guide bands are designed to work specifically with the size of micro guides to facilitate an easier rod build. For instance, the main purpose of the guide bands is to hold the micro guides in place for thread wraps. 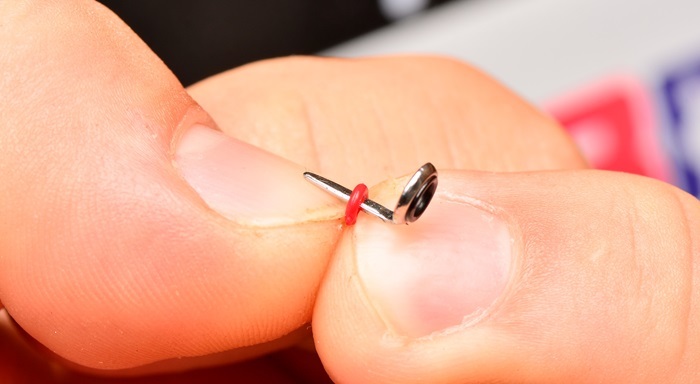 Now that’s not all they do, but let’s be honest, that a huge plus with these tiny guides. After your guide spacing is marked on the blank, you can start moving the guides into place. Start with the furthest guide down the blank and work your way to the tip. 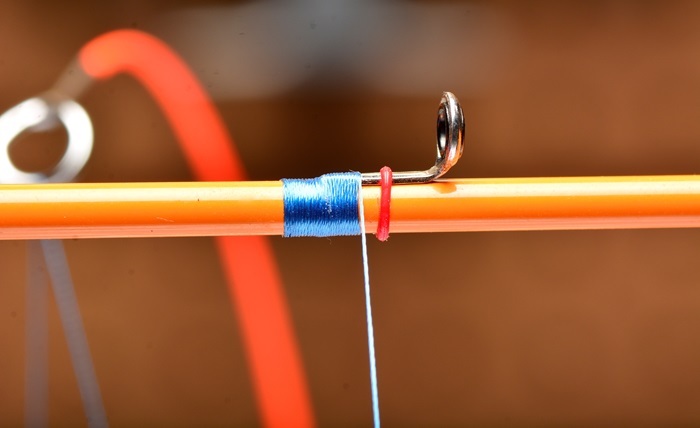 Try the proven method below to slide micro guides and bands onto the rod blank! 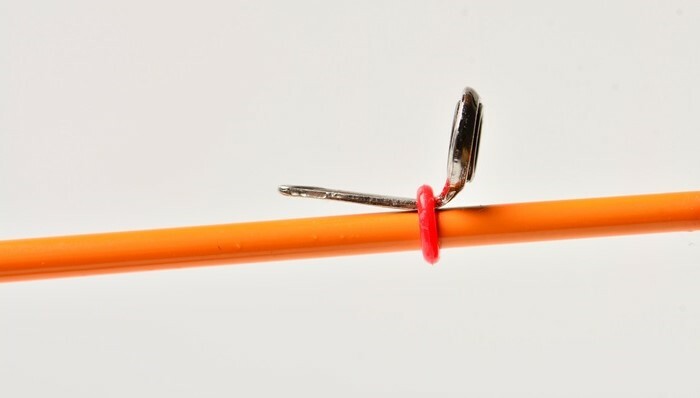 This method may take some practice to get down, but it is by far the easiest way to get micro guides and micro guide bands onto the rod blank. 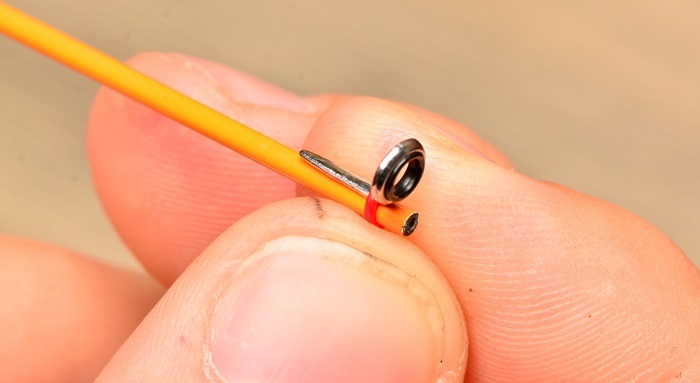 It’s one thing to get the micro guide on the rod blank, it’s another thing to move that small guide into place while keeping it under the band. 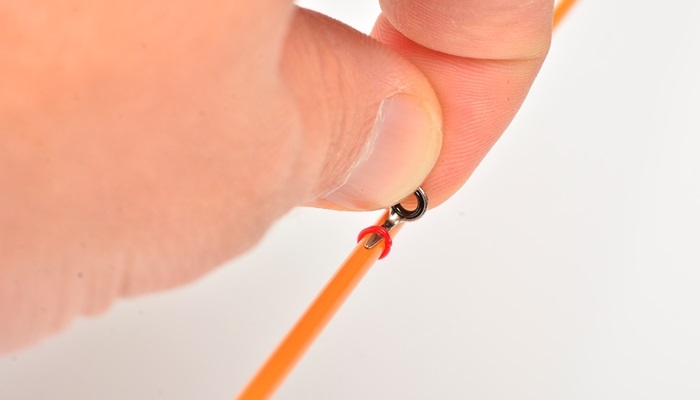 Moving micro guides down the blank is much simpler if you start by holding the top of the eye and the tip of the guide foot between your thumb and pointer finger. Trapping the guide band in the v-notch between the eye and the foot allows you to easily slide the micro guide into place with the guide band. This method is popular because it also helps keep guide spacing marks intact as you move the guides over each mark down the blank. The guide spacing is usually marked on the blank by now, but sometimes it can look wrong if just a single measurement is out of place. The good news is that if your measurements are slightly off, it’s an easy fix with micro guide bands. In cases like this, it’s very helpful to be able to move and adjust the guide’s spacing as you work. Micro guide bands allow you to easily maneuver the micro guides on the rod blank without losing the guide foot. The micro guide bands are great for adjusting guide spacing, but that’s not all. These bands are also excellent for spot checking and correcting guide alignment as well. You guessed it, that second guide is slightly out of alignment in the guide train. 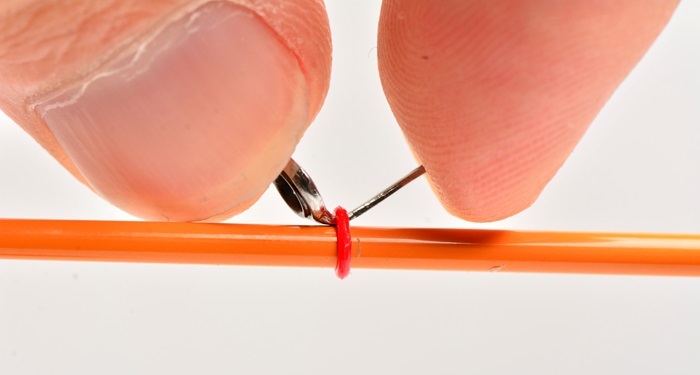 Previous to guide bands, tape or even guide foot adhesive were popular for securing guides, but these methods make final adjustments much more difficult, especially with the miniature size of micro guides. With micro guide bands, simply grab the micro guide by the eye and slowly rotate it back into alignment. It’s that easy because of the dependability and user-friendly design of micro guide bands! Guide spacing and alignment are very important to the performance of fishing rods and that is no different with the use of micro guides. 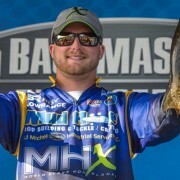 Micro guides bring awesome benefits to performance and micro guide bands are the best tools to use to help your fishing rod realize this potential. 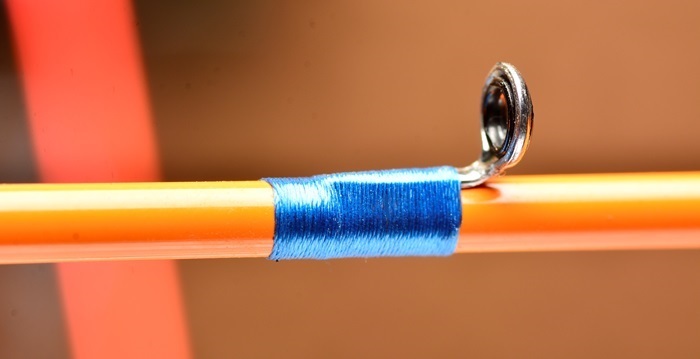 When it comes time to wrap your micro guides with thread, the micro guide bands not only help keep each guides in place, they also make them easier to wrap. 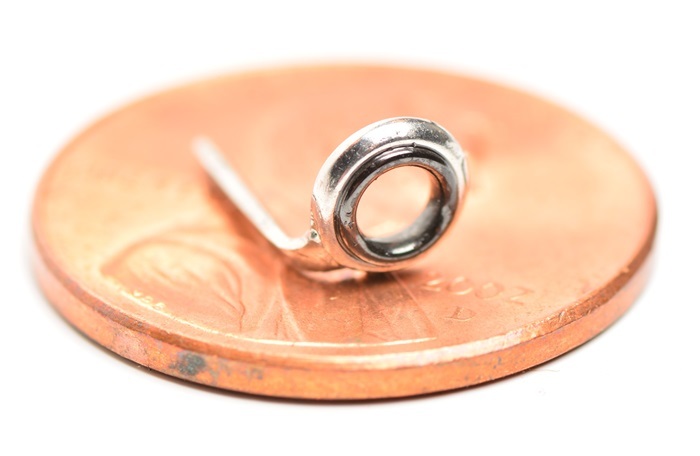 Micro guides don’t take many thread wraps, yet their size can complicate the thread wrap in no time. But with micro guide bands holding the guide in place, you can wrap thread up to the band then just snip the band off once the guide is secure. This removal method doesn’t sound like rocket science, but trust me—it’s a huge help. In the past, rod builders have reported some issues with removing tape or guide tubing from micro guides without boogering up the thread wrap. Whether undoing the thread wrap or popping out the guide foot, you’d be surprised how easy it is to mess up a micro guide wrap. If you use micro guide bands however, they facilitate faster, easier thread wraps. Plus, they are simple to remove and you don’t have to worry about loosening the wrap or losing the guide! 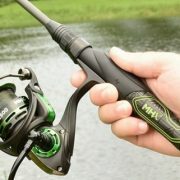 Simply slide the guide foot into the micro guide band and then slip both over the tip of the rod blank and into place. Once you’re ready to wrap, make sure the guide band is close to the center of the guide foot. If the band gets too close to the eye, the guide foot will pop up. Or if the band is too close to the edge of the guide foot, it won’t be possible to remove without damaging the thread wrap. With the guide in place, wrap thread up and over the foot until the guide is secure enough to remove the micro guide band. Micro guide bands work brilliantly to keep micros in place, but they are also popular because they are so easy to remove. To remove the guide band, lightly press the corner of a razor blade down on the band. Make sure you cut the guide band over the guide foot with the blade towards the eye rather than the thread wrap. This cuts the guide band quickly, but more importantly, keeps it a pain free experience for your rod blank and thread wrap. It’s no secret that micro guides are a hit for anglers all over because they bring awesome performance advantages. From increasing sensitivity and casting distance, to reducing weight, line tangles, and frame damage, micro guides are the small components creating big waves in rod building and angling alike. See more micro guides here! Don’t let building with these miniature guides scare you away! 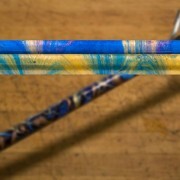 Instead, use micro guide bands to make building rods with micro guides faster and easier than ever. 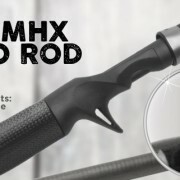 Looking to build a rod with micro guides? Well, look no further than our multi-option rod kits. With micro multi-option rod kits, you can get all the rod components necessary to build your own custom fishing rod with micro guides. 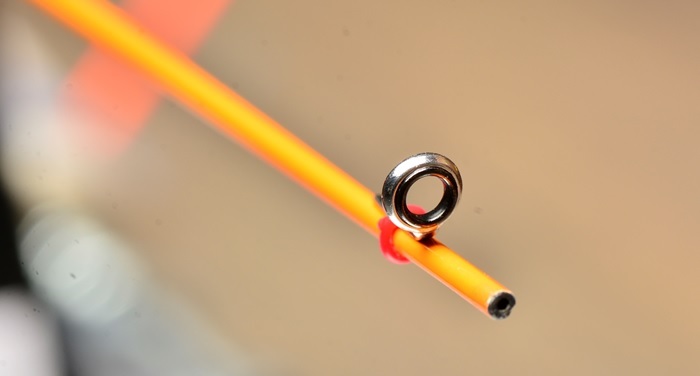 Start building your new rod with micro guides now!